During the months of July, August and September, all eyes turn to the world renowned Maasai Mara Game Reserve, situated in south-western Kenya, for the incredible wildebeest migration from the Serengeti to the Mara. Known as the ‘World Cup of Wildlife’, this is an incredible experience to witness and if there is ever a safari to go on, this would be it. This is a massive movement of over 2 million animals , not to be seen anywhere else in the world. Not only do the animals have to cross the Mara River where the crocodiles are waiting to prey on them, but once they arrive in the Mara, they will be hunted down by the larger predators, lion being the most common as the Maasai Mara has one of the largest populations of lion in the world. So how did it all start? How old is the migration? It started in the early 1970s, after a widespread immunization campaign against rinderpest in cattle led to the disappearance of rinderpest in wildebeest and buffalo. This, together with an increase in dry season rainfall, led to an increase of the wildebeest population, and the migration began spilling over to the Mara. The migration starts in June….the red oat grass in the Reserve is so long by this time that the only animals visible are the larger animals like the elephant or giraffe, or a lone topi atop a termite mound. Although there is a stillness in the air, the lions are waiting, resting in the shade of the acacias. 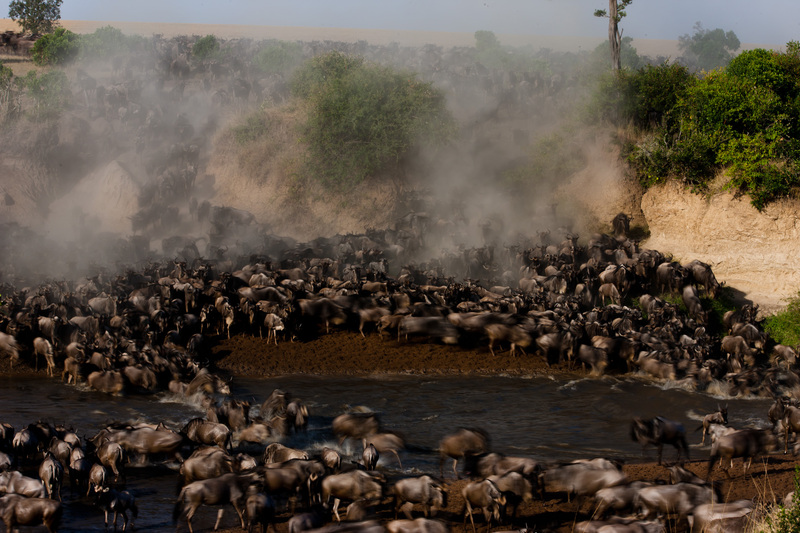 Then by the Sand River, can be seen small specks rising to become clouds of dust – the wildebeest have arrived! Within a few days, thousands of wildebeest are snaking through the long grass towards the Mara River. The river crossings are spectacular and exciting, earning the attention of the media and tourists alike. 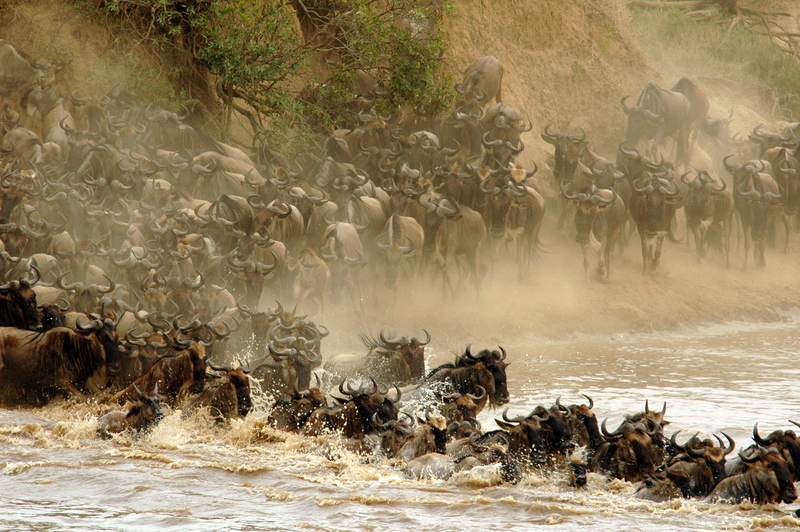 The wildebeest gather on the banks of the Mara river, in greater and greater numbers. The river is filled with huge crocodiles, anticipating this bi annual feast. The wildebeest are nervous, moving around, not wishing to be the first to plunge into the river which is filled with the sharp jaws of the waiting crocodiles. 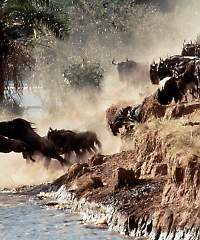 Suddenly one wildebeest is pushed into the river, and is followed by hundreds more, swimming desperately to make the opposite shore. But many will not make it. Some will die at the hands of the crocodiles, while others will drown and still others will be trampled to death in the excitement. 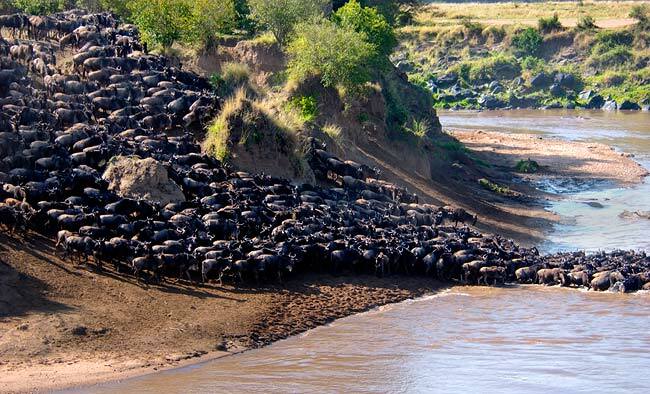 There are 3 popular crossing points on the Mara River – two are in the Mara Reserve, at Little Governor’s crossing point and at Serena crossing point, and one in the Mara North Conservancy at the Kichwa Crossing point. Once they reach the plains, it is the actual spectacle of so many animals filling the landscape in shifting columns that is awe inspiring and is a spectacle that cannot be seen anywhere else on earth. Then the wildebeest move out to the private conservancy areas to graze the plentiful green plains and to mate. The mating ritual lasts a few days only, ensuring that all calves are born at the same time, for greater protection. The wildebeest begin their return trek to the Serengeti in mid October, giving birth to their calves on the plains of the Ngorongoro Crater. As the area dries out and water & grass begin to get scarce, the wildebeest keep moving, again & again, and so begins another migration – trekking the vast distance from the Serengeti to the Mara. The wildebeest cover an estimated 3000 km in their annual migratory cycle, with newborns in tow. Will you be one of the lucky ones to catch the migration this year?